During the SDCC 2011 World of Warcraft, StarCraft and Diablo Swag Show panel held by Blizzard Entertainment and its licensed partners, Blizzard license product manager Kat Hunter and Blizzard SVP of Creative Design Chris Metzen revealed a few details of the upcoming Diablo III: Book of Cain. The publisher of The Cinematic Art of World of Warcraft: The Wrath of the Lich King … Insight Editions is collaborating with Blizzard Entertainment to develop this canon product. Stay tuned to Blizzplanet. I have been in contact with Insight Editions since early July and waited until the SDCC panel for the official roundup of details to surface. Now that the cat’s out of the bag, I will request some preview scans. This might take a while because the Book of Cain book will be on sale around the Diablo III launch date. 13:34 – “We are highlighting Heaven and Hell, the people that lives there, the realms of Heaven and Hell, the history of Sanctuary, the lands of Sanctuary, highlighting maybe the classes that have been playable in the games up to this point, notable people in history and pretty much trying to create a fairly tight compendium of all Diablo lore and you know one nice edition. So with any luck, that book will pop around whenever the game comes out and will be a very useful tool in getting back up on what’s up with the Diablo universe. So that’s something we are very very excited about and working on rapidly and intensely right now. During the SDCC 2011 World of Warcraft, StarCraft and Diablo Swag Show panel, Blizzard licensing product manager Kat Hunter reported they are excited about their new partnership with Mega Bloks. 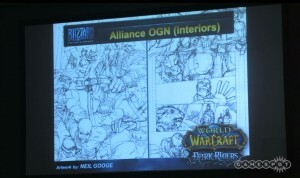 A product line-up will be revealed more in-depth at BlizzCon 2011 between October 21-22. The first wave of products will come out in 2012. Kat Hunter displayed onscreen a work-in-progress of the StarCraft II Viking Mega Blok. It actually transforms back and forth between flying or land vehicle modes. Could this be a hint of what some of these products are capable of? 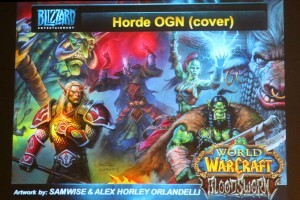 This product was shown to Blizzard recently by Mega Bloks representatives. Blizzard fell in love with the prototype and the house of ideas started jamming right away with the guys at Mega Bloks the possible line-up of StarCraft II and World of Warcraft units that might be attractive to fans. They decided which products will come out first, and last. More information will come afloat at BlizzCon, and Kat Hunter revealed there will be a BlizzCon exclusive Mega Blok set of 2000 pieces. I’m not certain if it will be in the Swag Bag or on sale. We will find out as BlizzCon nears and the Swag Bag content is revealed. 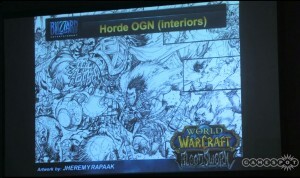 During the SDCC 2011 World of Warcraft, StarCraft and Diablo Swag Show panel, Cryptozoic CEO Cory Jones revealed a new World of Warcraft TCG expansion titled Throne of the Tides which introduces a third faction which includes new monster heroes and races: Naga, Murlocs, Ogres; and monster allies for your card deck. Cryptozoic is very excited about this new feature. In addition, Cryptozoic plans to introduce a new Product known as “Dungeon Decks”, a new gameplay dynamic for small amount of players 3-5 or such. Automated Dungeon Decks! – Introducing a brand new raid style product! Level Up! – Fight your way through the dungeon, and add powerful new cards to your deck as you level up! Popular Dungeons! – Featuring The Deadmines, Scarlet Monastery, and Shadowfang Keep. Cryptozoic CEO Cory Jones and Micky Neilson debunked the rumor I started (bonks-self) that there are plans to launch brand-new mangas. 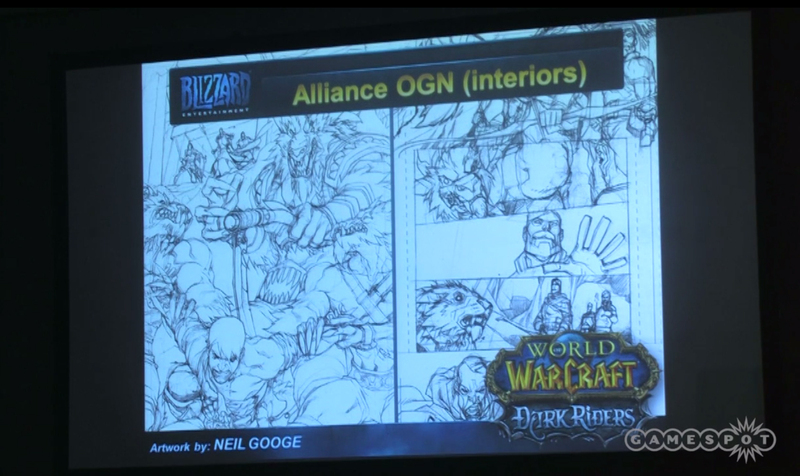 However, Micky Neilson and Chris Metzen acknowledged they loved to develop all these mangas with TOKYOPOP, and the door is not close for new Warcraft and StarCraft manga some time in the future when the time is right and ripe. That’s certainly a relief. Want Moar Manga. Cory Jones: “14:28 – One of the things that we hope to do with the TCG is the idea that we need to continually innovate and create something that remains fresh and fun for our consumers. We are coming into five and a half to six years now. We’re now on our sixteenth set of the TCG. I think that’s a remarkable accomplishment. Most TCGs don’t last that long. 15:00 – But for that to be something that is a benefit, we need to continue to innovate. When Blizzard helped create Cryptozoic that was one of the big things that came out of that was they want a partner that you know do whatever it takes to make sure that part of quality is there. 15:14 – So the next set coming up is THRONE OF THE TIDES, and it’s going to be very interesting because for the first time we’ve created sort of a third faction. Not an official faction, that is monster specific. The first set will allow you to play a monster hero and you will have the nagas, the murlocs, the ogres — and the handhold that goes along with playing these monster races are incredibly fun with splashy effects, and the set will also have monster allies that you can put on your deck. 15:48 – So the way it’s going to work is you can be Horde or Alliance and throw a monster in, or be a Monster Hero and if you are a Monster Hero then you can only play with Monster Allies which is going to be a ton of fun. We are very excited about it. 16:01 – So the next thing, we’ve been lucky enough to be right next door to Blizzard and work very closely with them, and so for this very next set coming up — the Aftermath block — we are gonna actually include sort of [one on one ties (sp?)] back into the lore and the story as it’s happening. 16:16 – That has always been a challenge for the trading card game because the lead times are so long that you have to actually catch up with what’s happening in the MMO is incredibly difficult. We’ve finally after five years now been able to accomplish that with the last set of the Worldbreaker block actually included things around Cataclysm and as you can see in the last set we have actually gotten Deathwing as a Master Hero, so that was a splashy exciting card that we were able to include. 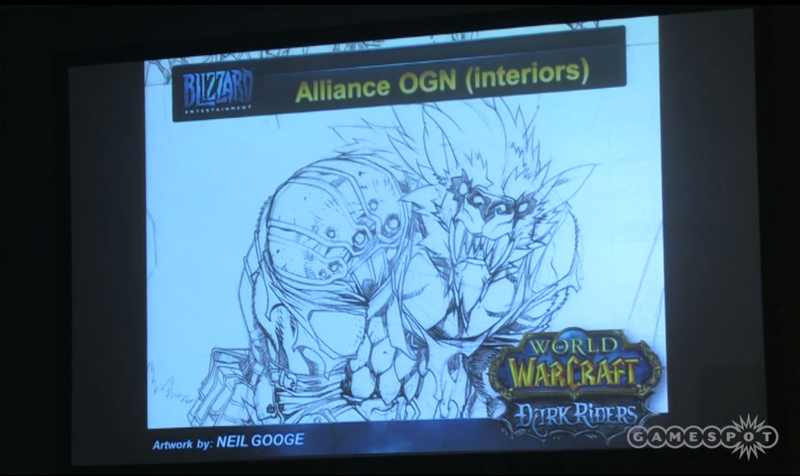 That was awesome, and as we move forward, we are actually working with the lore team and with Chris Metzen to make sure that characters, in advance, that are going to be coming up in the MMO are reflected in the trading card game so that it’s a very natu ral extension of your experience with the IP in terms of learning about that lore, and for me that’s what I feel is great about all of this license because it allows you to have a much deeper connection to this property we are very very passionate about, and we want to make sure that we are one of those companies that advocates that experience, that’s a big priority. 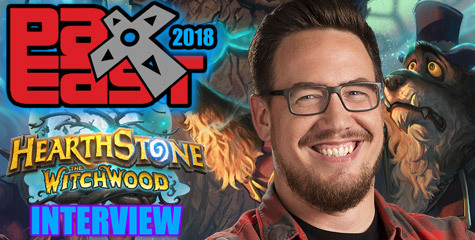 17:15 – So one of the core elements for Cryptozoic is our model which is “Fans first”, and nothing really speaks to our “Fans first” ideal as much as all of the events we put on. We spend millions of dollars a year putting on events all around the world. We attend all of the major shows, and we make sure that they are very active; and large communities centered around the trading card game have this incredibly robust organized play program. 17:34 – Coming up for 2011, we actually have our World Championships, it’s going to be in Amsterdam. We are a global property. It’s just like the World of Warcraft MMO. We have offices in China, we have offices in Europe. We service an actual global community. One of the things we did recently was a World Cup, and we had 26 different countries represented with their own teams, it was very successful event. Everyone had a great time. 18:10 – Coming up shortly is the World of Warcraft World Championships, that’s gonna be in Amsterdam, and it has $250,000 as a cash prize pool, which is by far the biggest cash prize pool for any TCG out there. People gets very excited about that. It’s a very serious competition, and we are looking forward to see how it turns out in that event. 18:34 – Some of the things we are trying to do is to support the Brick and Mortar Hobby industry without finding someone to play a physical trading card game. So having some of those shops supported and doing great, having a place where you can go to meet up with your friends, and play some WoW TCG is incredibly important for us. We are doing all kinds of programs. One of the ones coming up are the Goblins of Anarchy Promotion. So we put out a series of four different cards and the only way to get these cards is to actually go down to a local Hobby Store and they give it to you free as a participation prize, and when you are actually going to run events when you can play with these cards on your deck, and they are not legal typically because they are wildly overpowered but it’s going to be something you can play with in these tournaments, and they are incredibly fun. The goblin cards are Power, Time, Cunning and Money. Those are the riders of the Apocalypse for the goblins. 19:35 – The WoW TCG innovated the idea of a raid deck where it was sort of a “one versus many” idea where someone would be the raid boss, you would invite friends over and you could have this sort of very interesting single experience with your friends trying to build this series of decks that could [be you as a massive raid boss], and playing all those overpowered cards and trying to beat other people is quitely enjoyable, and you would team up with other players to try to take your friend down. 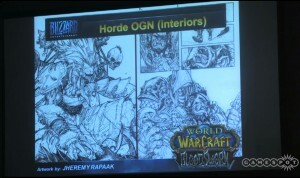 20:08 – We had an incredible response to that over the course of the WoW TCG’s life. As always we try to think through how we can innovate and come up with something a little different and unique play experience. What we are doing moving forward is we are doing Dungeon Decks. So the idea of a dungeon deck is that it is a smaller experience than the Raid, but it is an automated dungeon deck. Sometimes it is hard to find a group of four people to play a trading card game with. The way that this works is that you can actually play between two and four people against the dungeon deck. Or we could play three people with the Class Starter Deck, one of the gr eat features of it is there are rules inside the dungeon deck to level your deck up, so you’ll actually be able to get experience and then have access to new cards to add to your deck based on your deck leveling up. So you can continue on with the same deck and face all of the different dungeons: The Deadmines, Scarlet Monastery, and Shadowfang Keep. We have tons of quests for those locations, because people have such a strong emotional connections to those original dungeon experiences in WoW. 21:30 – Very excited about dungeon decks. The idea of leveing up my deck, and it is something I keep and I bring with me and I add new cards and I think about what kinda cards I want add as I level. 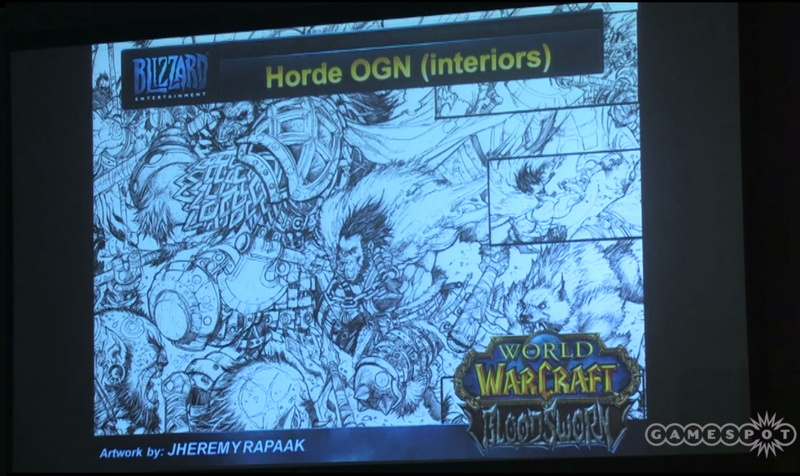 That to me is very compelling as a huge fan of Warcraft and also as a huge fan of the TCG. 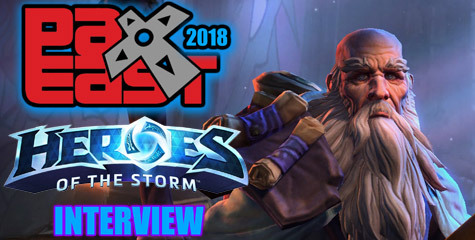 Blizzplanet has gathered a round up of Blizzard Entertainment products unveiled by Chris Metzen, Micky Neilson, and licensed partners: Mega Bloks, Cryptozoic Entertainment, J!NX, Gallery Books, Insight Editions, and DC Comics. Blizzard Entertainment’s Legendary Samwise Didier (Senior Art Director) will be signing at the Artist Alley table AA-09 at the San Diego Comic Con 2011 all four days through July 21-24. 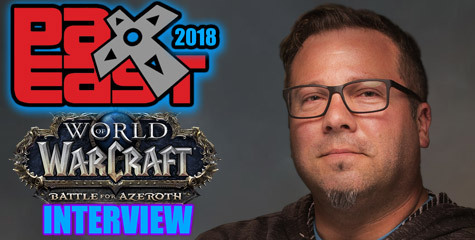 This is a perfect opportunity to meet the man that has inspired and shaped the visuals of StarCraft, Diablo and Warcraft universes. 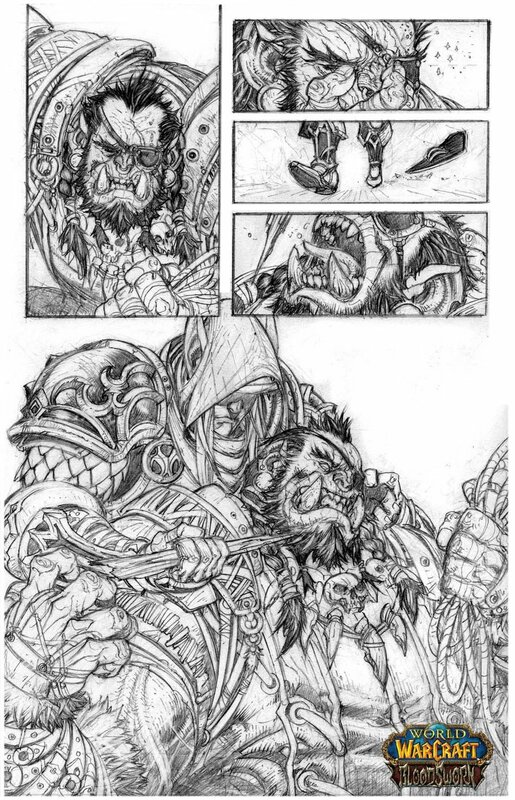 You can see some of Samwise’s artwork at the SONS OF THE STORM Website. “If you are at Comic-Con this year, make sure you swing by Artists Alley for I will be commanding booth # AA-09. If you have art you want signed, bring it! If you do not, fret not. I will have cards, prints, and posters for sale. So stop by, bring ale, swords or other worthy offerings to the Panda King and we will revel in the Comic-Con majesty! For the bloody Horde! Samwise Didier will bring 8.5″ x 11″ prints of his favorite World of Warcraft Horde and Alliance cards, World of Warcraft artist proof cards, and two non blizzard artwork posters (11″ X 17″ and 28″ X 36″). You can’t miss grabbing any of these limited and rare gifts. Any other product: Game and expansion boxes, posters, StarCraft/Diablo products, or any other artwork made by Samwise Didier. YES, YES, yEs, yES, Yes, YeS, Y-E-S (cools off) … Chris Metzen is coming to San Diego Comic Con. 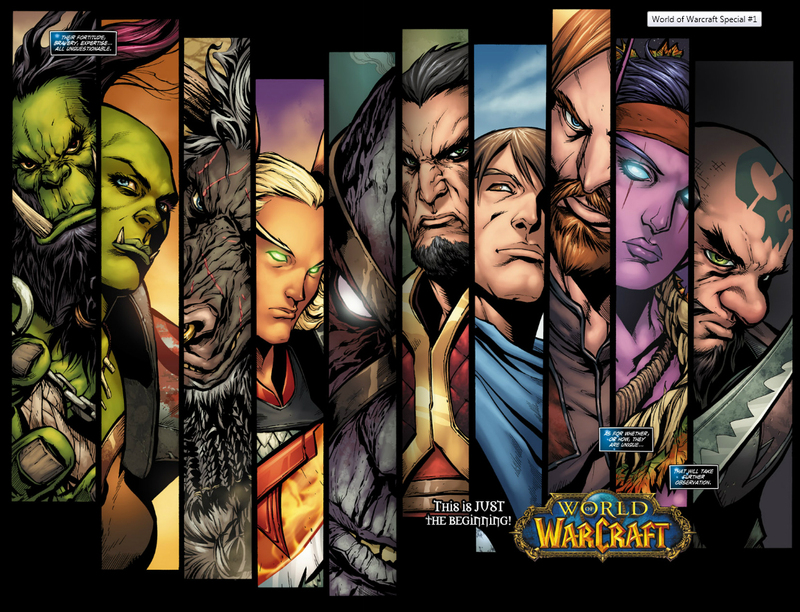 You have heard here in Blizzplanet details of the World of Warcraft Graphic Novels might be revealed at this upcoming event to be held on July 21-24. Stay tuned on Blizzplanet for any new information. I’ll be contacting some of my past liaisons. Here are the details for all our Blizzard Entertainment fans. It seems Blizzard and their licensed product partners are unveiling a few surprises for DIABLO, World of Warcraft and StarCraft fans!!! … clears throat — DIABLO products !!!!! Kat Hunter (BlizzCon coverage moderator on DIRECTV). 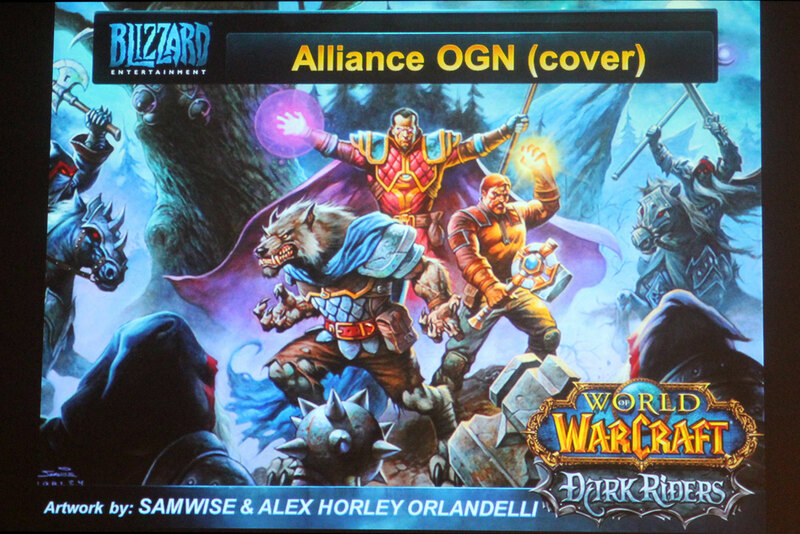 Things this panel might unveil … details of the World of Warcraft: Alliance, World of Warcraft: Horde and StarCraft Graphic Novels seem imminent with the presence of DC Comics Hank Kanalz in this panel alongside Chris Metzen. 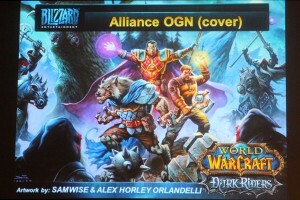 Cryptozoic Entertainment’s Cory Jones might unveil upcoming World of Warcraft Trading Card Game products. Jinx might announce the Fall 2011 line-up of World of Warcraft, StarCraft II and Diablo III T-shirts. There’s no word from Sideshow Collectibles, but I asked Sideshow’s president in a public Q&A about two or three years ago about upcoming Blizzard products and he admitted there were some ideas on the table. Could this be the year? I bet many owners of the Barbarian diorama would be happy to get ahold of the other four classes to make it company. 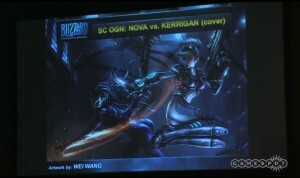 Sideshow Collectibles booth # 1929 — update: Sideshow confirmed no Blizzard licensed products to be announced at SDCC. Italian painter Lucio Parrillo will be at a non-Blizzard panel at Room 28DE on Thursday, July 21 from 2:30pm to 5:00pm. If you are a WoW TCG fan, bring your cards for signing. Check out the map below by holding the right-button and choosing “Open Link in New Tab”. The green square marks will help you find the booth numbers listed above.